You’ve spent months searching for your dream wedding gown and all the romantic accessories that go with it. Now you’re at the pointy end of your budget, and wondering if it’s worth handing over more money and getting a professional makeup artist to do your wedding day makeup and complete your look. The answer is a resounding yes! 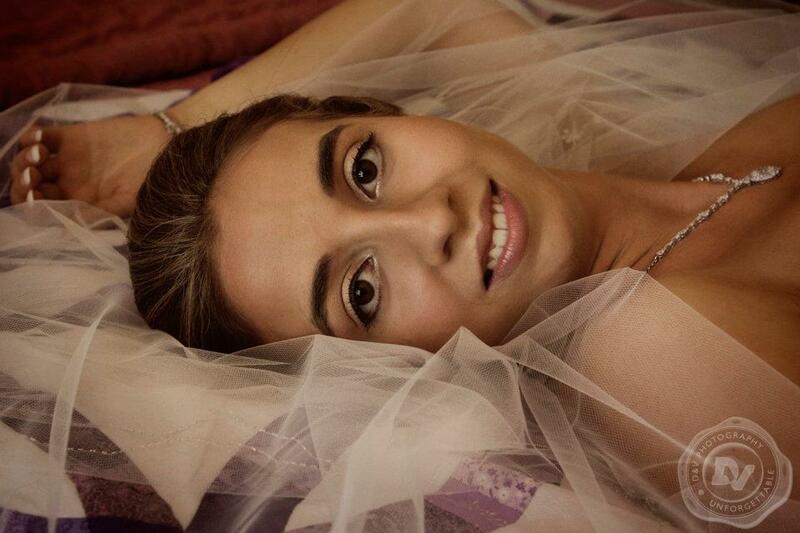 There are many benefits to hiring a professional to do your wedding makeup. They are trained and qualified to create a look that enhances your natural beauty, and that will complement your entire wedding day. This is particularly important if your wedding has a specific theme, perhaps Gatsby inspired, for example. And even more importantly, professionally applied makeup will stay in place all day and look fantastic in your wedding photographs. Hiring an expert also eliminates the potential problem of wedding day jitters getting in the way of effectively applying your own makeup. Shaky fingers and liquid eyeliner are never going to be anything other than a disaster in the making! Once you’ve settled on a makeup artist you feel comfortable with, it’s important to make an appointment for a pre-wedding makeup trial, so when your big day arrives, you’re 100% happy with the way your makeup looks and feels. Here are a few things to keep in mind. By scheduling your makeup trial in the morning, you’ll be able to see exactly how well your makeup copes with a normal day’s activities. Remember to keep a note of how and why you refresh your makeup during the course of the day, so your makeup artist can add or adjust products accordingly. Consider having your wedding makeup trial on the morning of your engagement party, or another special event. This allows your friends to critique your look, and photographs from the event will show you how your makeup looks under different lighting conditions. Like many brides-to-be, you probably want a natural look. But from a makeup artist’s point of view, a look that appears natural both indoors and outdoors, during both day and night, and works well with the style of your hair and gown, requires a lot more than a tiny splash of foundation and a smidgeon of colour. The reality is a natural makeup look isn’t achieved by the amount of makeup applied, but by the skill of its application. So don’t be too hasty in wiping off what you consider to be too much makeup. Instead, get your makeup artist to explain their choices. It may be that lighter colours will likely wash out in photographs, leaving you looking pale and tired. And that’s definitely not the type of natural look you’re aiming for! The only time you need to be quiet during a makeup trial is when colour is being applied to your lips, and that leaves a lot of time for talking. So ask as many questions as you need to understand how to keep your wedding makeup looking fresh and fabulous every minute of what could be a very long day. Along with asking questions, give your makeup artist as much information about your wedding day as possible. Include the setting and the season, whether it’s an indoor or outdoor wedding, supply colour and fabric swatches for the bridal party and overall wedding theme, and images of makeup looks that you admire. Finally, keep in mind you may need more than one trial with your chosen makeup artist before you’re completely happy with the results, so book your first trial at least three months in advance. This allows plenty of time to experiment with different looks. It’s also a smart idea to have a final makeup try-out within a week or two of your wedding day, when the condition of your skin and the weather temperature are likely to be similar to your big day. Every Hunter Valley bride wants to look her absolute best on her wedding day and one way to maximise the chances of looking picture perfect all day long is to secure the services of a professional in bridal makeup in the Hunter Valley area. Yes, it is an extra expense to add to your wedding budget, but you’ll get the benefit of the specialist knowledge that will keep your makeup in place and looking flawless throughout all the emotion of the day. Professionally applied makeup used with the appropriate primers and powder means there’s less risk of your look running, smudging or simply evaporating. An artist applying bridal makeup is likely to highlight either the mouth or the eyes, not both, because it can look overdone. As an example, if you’re going for a gentle romantic look, then you might want to keep the mouth soft, and focus on creating a really dramatic look for the eyes. If you’re confident that your eyes can speak for themselves with just a subtle frame, then your makeup artist may suggest using a bold colour on the lips to create a more vivid look. If you’re not sure what might work best with your skin tone, facial shape and dress style, a professional makeup artist can act as a skilled consultant. In a trial session you’ll get to experience the effect of emphasising eyes versus mouth. As well as showing you just how beautiful you can look with the right makeup, it’s also an opportunity to find out what you feel comfortable with. There’s no point in going for a dramatic red pout if this feels too bold and just not ‘you’. You can also help your makeup artist understand what you want by arming yourself with pictures of some makeup styles that appeal, such as examples of great colour and shading on eyes or lips. After all, it’s generally much easier to show someone what you mean, rather than to try to describe a particular shade or look. If possible, try to take a snapshot of your wedding dress (perhaps on your phone) so that your makeup professional can get a good idea of the style and create a look to match. For the majority of women, bridal makeup is generally best thought of as enhancing their natural beauty, rather than making a statement in itself. It’s usually best to set aside ideas about anything really dramatic or unusual that you may have seen in a magazine shoot, as these looks are designed more for the catwalk than the clear light of day. While we all hope it won’t happen, pre-wedding stress and nerves can add up to unfortunate last minute skin blemishes. With a professional makeup artist on hand, this needn’t be a disaster as they will usually have a range of tips and tricks to deploy, from skin-calming serums to concealers, powders and ways to shade the face to draw attention elsewhere. One of the best ways to get confident about your wedding day makeup is to have a practice run. Schedule a trial for another special occasion, such as a romantic dinner or birthday party. When you’re ready for a trial session, we’ve made it easy to find professionals who specialise in bridal makeup in the Hunter Valley area. Just click over to the Hunter Bride directory listings, and get ready to feel and look like a star! Effective wedding makeup is not just about a flawless finish. You need makeup that’s going to not only ensure you look wonderful in the all-important wedding photographs, but also last through a long day and evening, without fading. We know you want to look fabulous on your wedding day, and although you are perfectly competent at putting on your everyday ‘face’, there’s no better occasion than a wedding to call on the services of a makeup artist. An expert can advise you and help you achieve the look you want from your wedding makeup. Cessnock boasts a number of wedding makeup professionals, and you can find them all in one place, thanks to the Hunter Bride directory. Here’s a quick guide to the seven secrets of perfect wedding makeup, and why hiring a professional is a wise idea. To achieve a finish that looks flawless through the photographer’s lens, a makeup artist has the experience to use neither too much, nor too little, and to make sure the foundation is right for your skin type and colour. They will take a number of factors into account, including the need to properly conceal any under-eye circles. This is vital, otherwise your eyes can get lost in photos, no matter how creatively the photographer lights the shot. There are two secrets to achieving a radiant glow, and one is to avoid products with mica in them, otherwise you could end up looking a bit too shiny instead of super healthy. The other secret lies in getting the right shade of tan. Professional makeup artists generally know which products work best with individual skin types, and sensitivities. They’ll also make sure you don’t turn orange! Wedding dresses often feature a dramatic neckline designed to perfectly frame your face. This is all very wonderful, except that it can cruelly highlight uneven skin tone in the neck and décolletage. Solution? A professional will blend foundation lightly over neck and upper chest for a truly seamless finish, without staining your dress. Secret 4: more blush please! Yes, more blush. More than you think you need, because it gives your face the shape, contour and colour that will make you look so good in your photographs. This is where working with a makeup artist comes in really handy, because the camera doesn’t see things quite the same as the naked eye, and a professional knows exactly what’s needed. Too little blush and your face looks flat, too much and – well, we’ve all seen those disasters! The trick here is to wear a lip colour just slightly darker than your normal shade, so that your lips really pop in the photographs, but don’t dominate your face or detract from your eyes. You’ll also need a long-lasting product if your lip colour is to survive all the champagne toasts and kissing. An expert can help advise you on the right product to use. Ask your makeup artist for samples of the products they use for discreet touch-ups throughout the day. That way, there’ll be no worries about colour mismatch, caking or shine. Secret 7: trial avoids error! Organise a trial makeup session, and try and wear a top that’s the same colour as your wedding dress, or take a swatch of the material. This helps the makeup artist work out the right colour palette for your skin tone. These are just some of the secrets used by professional makeup artists and beauticians to create flawless wedding makeup. Cessnock is a great place to get married and many of the professional makeup artists listed in the Hunter Bride directory are happy to travel throughout the area, so they can be there for you when you need to look your very best. What’s more, you’ll find that many of our makeup artists can also take care of your hair too. Book a trial session and be amazed at just how fabulous you can look! With all of the fuss and excitement that planning a wedding can bring, it is no surprise that many brides forget about themselves in the lead up to the big day. There are just too many things to do and complete to take time out for some pampering, isn’t there? No. There is always time to make sure you are looking your best! There would be nothing worse than hosting the wedding of the year only to have the bride look like a zombie walking down the aisle, with flaking dry skin, dark circles under the eyes and dull hair. Luckily, with a bit of planning you can avoid this look completely and instead be the gorgeous, glowing bride you should be. All it takes is a plan. Even with your wedding, you have a full appointment book and a strict checklist so why wouldn’t you make your beauty routine part of it? Once it is written on the list, in black and white, you are far more likely to stick to it. And while it may feel indulgent at the time while having your facial, you will thank yourself on the big day when you are looking radiant. – Plan your beauty budget upfront so you know what can realistically be achieved. Some brides like to have a monthly facial in the lead-up to the wedding as skin renews itself every 28-days. But if this won’t fit within your budget, simply buy a good exfoliator to keep in your shower. – If the work you are planning on doing is more intensive than just a facial, such as a face-peel or laser hair-removal treatment, then now is the time to do it. You still have time to experiment with new products and procedures without the worry of having to look perfect and fresh in just a few weeks time. – Begin an exercise routine – it is never too early to get into good exercise habits. – If you were considering a change in hair colour for your wedding, now is the time to start experimenting. It will give your hair a chance to grow out if you find you don’t like the new look after all. – If you haven’t already started a diet and exercise routine now is the time to really get stuck into it. Hit the gym, go for jogs and swap those French Fries for a healthy salad. – If you are planning on applying fake tan, or having a spray tan, you should practice now. Test out a few salons to find the best one for you or if you are applying it yourself try some different products to make sure you find the best shade and get the application process down pat. – Even though this might be a fairly stressful time for you, it is unfortunately time to kick the nail biting habit. Stop the chomping now so nails will be in top form in three months time. – Go to the hairdressers to have your hair touched up by getting rid of any roots, but don’t try a new colour. – Have a manicure and pedicure and while you are at it, ask them for the works with a foot scrub and deep moisturising treatment to relieve any dryness. – Pack a little kit of supplies such as gloss and nail polish to take with you in case of emergency.